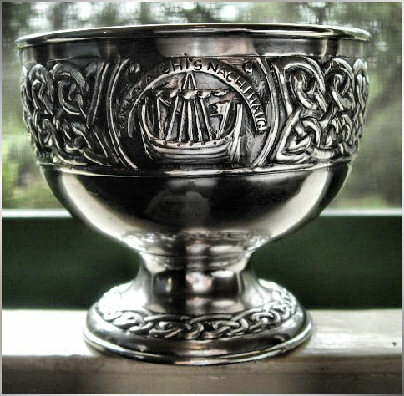 Beautiful and very rare silver or possibly silver-plated chalice by Alexander Ritchie. 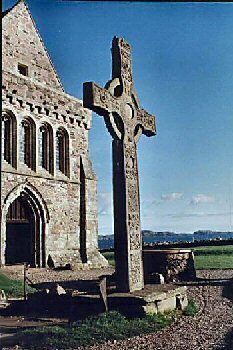 Marked AR IONA but no hallmark. c.1930. 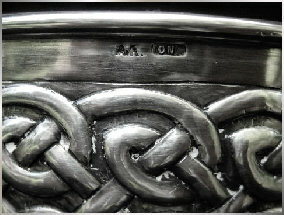 Gaelic inscription above a repousse longship design, and an elaborate knotwork border, as well as knotwork pattering around the foot. 4.75" high and 3.25" diameter. A very special piece and exceptionally high quality workmanship. Possibly a 'one-off' commission? 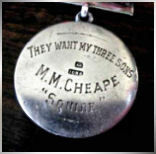 Solid silver pair of buttons by Alexander Ritchie - marked AR IONA and hallmark for Chester 1912. 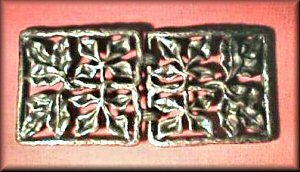 Alexander Ritchie silver buckle with foliate openwork pattern, reverse is marked AR and IONA within rectangles, and an early Chester hallmark for 1909, (date letter 'K'). Substantial solid silver letter-opener, length approximately 23 cms. 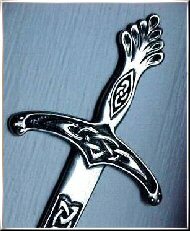 The design is similar to one used on his much smaller sword brooches. 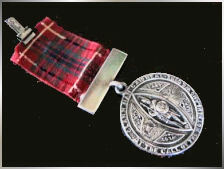 Markings are AR and IONA in inset rectangles, and hallmark for Glasgow 1927. 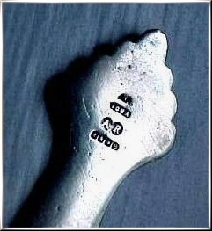 Early pair of silver cufflinks by Alexander Ritchie. Viking ship design, and marks AR and IONA, with Chester hallmark for 1912. Large silver buckle by Alexander Ritchie, length 6.4cms. Early separate recessed marks of AR and IONA in rectangles. No assay mark. Late 1910s - early 1920s. Someone muct have loved this one very much as they have carefully added a second pin, (leaving the marks visible) so that the item can be worn as a large brooch. Design is of intertwined beasts with small corner-panels of knotwork. This is one of the most unusual AR pieces I have seen, almost certainly cast as a 'one-off', and with strongly nostalgic connections to WW1 for some particular family. No assayers marks. Date c.1920 or earlier. 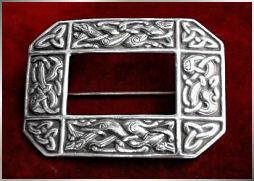 Early silver buckle with knotwork border, approximate length 1.25". 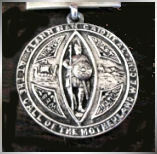 Reverse markings are AR and IONA within separate rectangles, and Chester assay mark for 1912.